The "Maharaj Noi" is divided into two parts, each not more than 60 cms wide. While one part is of the same colour and pattern as the "Maharaj Yai", the adjoining part is a long white flag tapering off to a point. The far right or "fly" end, which is cut in the shape of a bird's tail is only half the width of the left end, occupying 3/8 of the total width. This yellow flag [similar to th-r-qen.gif above but with smaller Garuda], measuring 10 by 15, with one side cut into the shape of a bird's tail, and the apex reaching a quarter of the way along the flag's total length, is similar to the "Maharaj Yai" in that there is a red garuda in the middle. Flown from the main mast of the Royal Yacht when on official business, it denotes the presence on board of Her Majesty the Queen. This flag was first used during the reign of King Rama VI, following the issuing of a special Royal Decree (R.S.129) specifying that there should be two types of flag for the exclusive use of Her Majesty the Queen, i.e. the above-mentioned "Rachini Yai" and the "Rachini Noi". These flags have been in use ever since  right down to the present day. This flag was used in place of the Rachini Yai whenever there was no order for a 21 gun salute. The flag has been in use since B.E.2453 [1910 AD] i.e. during the reign of King Rama VI  down to the present time. I have just come back from a trip to Thailand. I saw many flags of the present King's flags and Queen's flags which are quite different from the ones on the FOTW website (Garuda on yellow background). 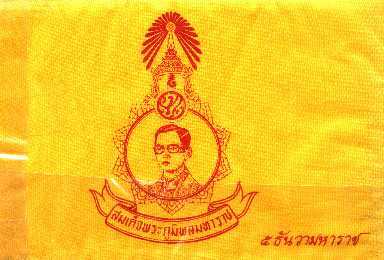 The King's flag is his crown shape and his Thai character initial in red below on bit [sic  'field'?] dark yellow. The shade of yellow is the same as of Thai Monks clothes that is the shade of yellow used in Sri Lankan national flag). Incidentally the same shade of yellow is used for a Thai Buddhist flag which is red wheel in the center on yellow background which is hoisted in most Thai temples as posted already. The Queen's flag is her crown (different from King's) and her name in Thai character on blue (the shade is lighter than blue of Thai national flag, I would say the blue shade is like Micronesian national flag). My Thai friend explained that these flags are hoisted two weeks before and after the birthdays of the present King and Queen (the Queen's birthday was about to take place when I visited Thailand). So I think these are royal personal flags besides royal flags and each King and Queen has his/her own personal flag. The described flags seem to be the ones created in 1996 in the 50 anniversary of the rule of Phumipol (1946-96). They show in Banderas and, if I do not remember wrong, photos are in the hands of Michel Lupant. I have some poorly drawn GIFs. Yes, these flags are very similar to what I saw in Thailand but letters/initials are a bit different. I hope to get a photo of the two royal hospitals in central Bangkok, donated by the King and the Queen, which have large copies of the King's and Queen's emblems on the wall where the details of their personal emblem can be seen clearly.